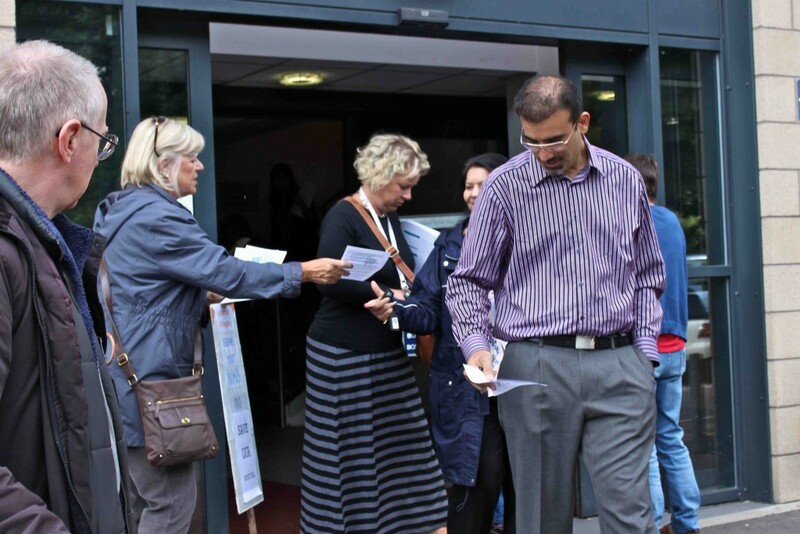 I gained entry to Calderdale Clinical Commissioning Group’s 20th August Stakeholder Engagement Event only after picketing it, along with other members of the general public. So there we were, offering a wider basis of opinion. But would the people inside the goldfish bowl be able to hear us? “If the CCG deem their plans to be for the benefit of people of Calderdale and Kirklees, then hold events that are open to the full public. Not a goldfish bowl event where they only invite people from organisations that they have a relationship with and that are supposed to represent us – but don’t really. Penny Woodhead, Calderdale CCG’s Engagement Officer, introduced the invitation-only meeting as a “listening event”, to hear what invited participants thought of the CCG’s two years “engagement work” on the Right Care, Right Time, Right Place proposals for the future of Calderdale NHS and social care services. So I pointed out that the review of the “engagement” didn’t mention that thousands of people in Calderdale are opposed to the CCG’s proposals. Calderdale Councillor Janet Battye immediately said that there are no plans or proposals and Calderdale CCG’s Accountable Officer Dr Matt Walsh backed her up. They said the two year “engagement” has been about asking people what they want from healthcare. Did I feel listened to? No way. The people who were supposed to be listening gave no consideration to my comment. Without a moment’s thought, they instantly denied its validity. They did this by manipulating the meaning of words with the sole aim of establishing “which is to be master” – to quote Alice in Wonderland’s Humpty Dumpty. However, in the small group I’d been assigned to, invited participants referred repeatedly to the “plan” and “proposal” – even though these supposedly don’t exist. Invited community group representatives at the stakeholder event, who spoke to picketers outside the meeting, said that despite “engagement champion” training, and engagement events with their CCG-approved organisations, many didn’t understand the CCGs’ proposals – or know how they were supposed to explain them to other people. The CCG uses “appreciative inquiry” as their “engagement” method. This invites selected groups of people to identify the good qualities of health care that they’ve experienced and then to “dream” about how this could be extended to the whole local NHS and social care system. It doesn’t explain to people what changes the CCG is proposing. “There’s not enough time to inform the public about the proposals – or rather, the model. People want a rationale for why there’s a budget constraint and what would the Care Closer to Home model look like? Dr Sajid Azeb, Clinical Director of Medicine at Calderdale and Huddersfield NHS Foundation Trust, said that staff shortages among consultants mean that the proposed hospital changes are needed (putting both Calderdale’s and Huddersfield’s acute and emergency services on one site, and all their planned care services on the other). This lack of evidence about an optimal hospital size is borne out by Sir Derek Wanless in his 2007 Report, Our Future Health Secured? A possible solution to small hospitals’ consultant staffing problems that doesn’t involve cutting and closing hospital services is given in Paul Jenkins’ 2014 article on The future of the small(er) district general hospital (Future Hospital Journal 2014 Vol 1, No 2: 69–71). This suggests that staffing problems could be solved by joint working contracts, so that many consultants appointed to bigger specialist hospitals would be contracted to work sessions at linked smaller District General Hospitals. Dr Alan Brook described the NHS bosses’ ill-judged public engagement events in the summer of 2014 as a “firefight” over “premature reconfiguration”. This led the Clinical Commissioning Group to shelve the formal public consultation that had been scheduled for the autumn of 2014. They then started carrying out what Cllr James has described as “goldfish bowl”, invitation-only engagement events for selected voluntary and community sector groups on their “relationship matrix” list – while they went ahead with planning and setting up the Care Closer to Home scheme. But Councillors on the Calderdale and Kirklees Joint Health Scrutiny Committee have said that the design of the engagement questionnaire was flawed, while Cllr Adam Wilkinson told the CCG that their claim that there had been no complaints about their Right Care Right Time Right Place proposals was “untrue”. This gives reason to doubt the openness and honesty of invitation-only “goldfish bowl” engagement events. I realised from talking to people who attended the Calder Valley Vanguard engagement event in Todmorden in March 2015 that they came away knowing nothing about the Vanguard scheme – not surprising, given the CCG’s “appreciative inquiry” engagement method that invites people to dream about what they’d like to happen, rather than to rationally consider specific proposals. This entry was posted in Social fairness and tagged Calderdale Clinical Commissioning Group, Right CAre Right Time Right Place, Stakeholder engagement event by jenny. Bookmark the permalink. Thanks for fact check. The info pack for the event simply said “Rory Deighton – healthwatch”. Info online seems to say you are both Development Officer for Calderdale Healthwatch and Voluntary Action Calderdale Info and Support Officer (Healthwatch). Is this right? How does that interesting organisational crossover work out? Given that VAC receives funding from Calderdale Clinical Commissioning Group and Calderdale Healthwatch is supposed to keep an eye on behalf of the public on the operations of Calderdale CCG and other NHS organisations in the area?